Insights: Fuel subsidy removal-In whose interest is Labour negotiating? Fuel subsidy removal-In whose interest is Labour negotiating? One thing that has emerged clearly in the current fight over subsidy removal is that most Nigerians are not really opposed to subsidy removal if it will go along with also a drastic reduction in the cost of governance. The argument that seem to come from Nigerians is that why should the government be asking that Nigerians make sacrifices in form higher fuel prices while at the same they keep all the perks of office. The President has tried to respond to this concern by Nigerians by announcing a 25% cut in basic allowances at the Presidency, which most Nigerians find laughable. Most Nigerians have railed against other presidency expenditures items like the billion Naira eating bill among others. Labour currently is negotiating with the government on behalf of Nigerians over the strike and the civil protest that has followed the removal of subsidy. However, the interest of labour and that of Nigerians are not the same on the negotiation table. The negotiations are deadlocked and reports coming from the meeting shows that the deadlock is primarily about if the price of fuel should revert to N65 or not. For me, this totally misses the point for which so many Nigerians have lost their lives. If all labour succeeds to achieve in this negotiation is to get another price fixing of fuel prices, many Nigerians would have died for nothing as it will not be long before another subsidy removal is moved by this government or the next government simply because these subsidies are not sustainable. What these current negotiations should achieve is a complete reduction in the cost of governance, transparency in government expenditure from the local government to the Presidential level and accountability in governance. This unfortunately is not what labour is negotiating. It is not in the interest of the government to improve transparency and accountability in governance because it will reduce the avenues for graft while it is not the interest of labour to reduce the cost of governance because it would likely lead to retrenchment and reduction in the ranks of labour. Besides, I think the Nigerian civil society group should not send people on the streets if at the end of the day they have no say in the outcome of what they are fighting for. Many times in the past, Labour has been allowed to negotiate after each subsidy removal, the result has always been the same with Nigerians returning to the streets over subsidy removal a few months after. This is basically because the government and labour always reach the solution that inconveniences their positions as little as possible. The government gets a higher price of fuel which they want and still keep the ability to dish out corrupt favours to its cronies. Labour also works away satisfied because, the government does not have to retrench any of their members to reduce the cost of governance and their members can continue to receive money running dead refineries and empty government agencies while helping politicians maintain the existing corruption infrastructure. If Nigerians really want a change that benefits Nigerians, this is the time to also ask for a seat at the negotiating table. This is the only way that Nigerians will get a solution that is beneficial to Nigerians. It is naïve to believe that Labour is negotiating for Nigerians. Nigerians would not have gained anything if at the end of the day this strike and civil protest are called off, and the presidency keeps its N1 billion food bill among other perks, the National assembly keeps its N150 billion budget which comes to about N320 million per house member per annum and if Labour works away with its N1.6 trillion wage bill and N800 billion overheard expenditure. Nigerians would not have gained anything if all the States keep spending billions of Naira in the dark without any form of accountability to any one on how they spend the billions they get from the Federation account every month and Nigerians would be the greater losers if this fight ends without us being able to check what our local governments do with the millions they collect every month. If all Nigerians succeed in getting out of this fight is a reversal of fuel subsidy, it would really be sad indeed. We would have just endorsed corruption with the lives of innocent Nigerians. If the civil society is really serious about moving Nigeria forward, they should immediately seek a sit at the negotiating table and influence an outcome that will really benefit Nigerians. I believe in the deregulation of the downstream end of the petroleum industry but it will be sad if the government gets away with it without a corresponding reduction in the cost of governance as well as greater transparency and accountability. 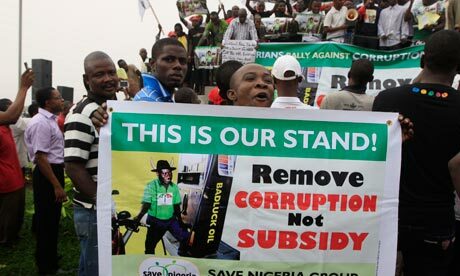 Maybe you don't really get the message before, now labour have been asking the government to fight corruption as it is the main problem Nigeria is facing even the protester if you look at their cardboard it mostly says remove corruption not subsidy especially one of the picture you are using for this post. Government cannot negotiate on fighting corruption because they will tell you they already doing that even though they are not making much progress. Again the labour says bring back the price to N65 then we can talk on the way forward so tell me how is that not in the interest of the people? the same so call cabal are friends to the government and some officials of the government. let me ask you how come the government only mentioned names of the companies benefiting from the subsidy and not the owners but yet they mentioned just three owners? because others are friends and some members of government. Please Nigerians know better than this stop trying to turn Nigerians against itself.